By the bank of a river stood a lodge, in which lived four brothers and their sister. The boys made arrows. To the branch of a tree in front of the lodge they had hung a rawhide strap, such as women use for carrying wood, so as to make a swing for the girl. Whenever their meat was all gone and they began to get hungry, The girl used to send her brothers into the timber to cut dogwood shoots to make arrows. When the arrows were ready, she would get into the swing and the boys would swing her. As the swing moved, they would see dust rising all around the horizon, and would know that the Buffalo were coming. Then all four boys would take their bows and arrows, and stand about the swing so as to protect the girl and not let the Buffalo come near her. When the Buffalo had come close, the boys would kill them in a circle all about the swing. They would quickly carry the girl into the lodge, and would kill so many Buffalo that the rest would be frightened and run away. So they would have plenty to eat, and the dried meat would be piled high in the lodge. One day the boys went out to get wood for arrows, and left the girl in the lodge alone. While they were away a Coyote came to the lodge and talked to the girl. He said to her: "Granddaughter, I am very poor, and I am very hungry. I have no meat in my lodge, and my children also are hungry. I told my relations that I was coming to ask you for food, and they have been laughing at me. They said, 'Your granddaughter will not give you anything to eat.' "
The girl answered him: "Grandfather, here is plenty of meat. This house is full of it. Take what you want. Take the fattest pieces. Take it to your children. Let them eat." The Coyote began to cry. He said: "Yes, my relations laughed at me when I said I was going to visit you and ask you for something to eat. They said you would not give me anything. I do not want any dried meat -- I want some fresh meat to take to my children. Have pity on me, and let me put you in the swing, so as to bring the Buffalo. I do not want to swing you hard so as to bring the Buffalo in great herds. I want to swing you only a little so as to bring a few Buffalo. I have a quiver full of arrows to keep the Buffalo off." The girl said: "No, grandfather, I cannot do this. My brothers are away. Without them we can do nothing." Then the Coyote slapped his breast and said: "Look at me. Am I not a man and strong? I can run around you fast, after you are in the swing, and I can keep the Buffalo off. I can shoot clear through a Buffalo. I have plenty of arrows, and I need only use a single one for each Buffalo. Come on, I want to swing you just a little, so that but few Buffalo will come." So he coaxed the girl, but still she refused. After he had begged her for a long time, she agreed to let him swing her a little, and got in the swing. He began to swing her, at first gently, but all at once he pushed her very hard, and kept doing this until she swung high. She screamed and cried, and tried to get off the swing, but it was now too late. All around -- from all sides -- the Buffalo were coming in great crowds. The Coyote had made ready his arrows, and was running around the girl, trying to kill the Buffalo and keep them off, but they crowded upon him -- so many that he could do nothing -- and at last he got frightened and ran into the lodge. The Buffalo were now just all over the ground about the lodge, and suddenly one of the young Bulls, the leader of a big band, as he passed under the swing, threw up his head, and the girl disappeared, but the Coyote, peeping out of the lodge door, saw on the horn of this Bull a ring, and then he knew that this ring was the girl. Then the Bull ran away fast, and all the Buffalo ran after him. When the Buffalo had gone, the Coyote came out of the lodge and saw that the girl was not there. He did not know what to do. He was frightened. Pretty soon he heard the girl's brothers coming. They had seen the dust, and knew that some one was swinging their sister, and that the Buffalo had come. They hurried back, running fast, and when they reached the lodge they found the Coyote just dragging himself out of a mud-hole. He crawled out crying, and pretended that the Buffalo had run over him and trampled him. His bow and arrows were in the mud. He told the brothers his story and said that he had tried hard to save the girl, but that he had not known that so many Buffalo would come. He said he had thought that the girl must be swung high, so that the Buffalo could see her from a long way off. The brothers felt very sorry that their sister was lost. They counselled together to see what they should do, trying to decide what would be the best plan to get her back again. While they were talking about this, the Coyote, with all the mud upon him, stood before them and said: "Brothers, do not feel sorry because your sister is lost. I will get her back again. Live on just as you always do. Do not think about this. Do not let it trouble you. I will get her back again." After he had spoken thus, he said, "Now I am going to start off on the war-path," and he left them and went away. He journeyed on alone considering what he should do, and at length, as he was travelling along over the prairie, he met a Badger, who said to him, "Brother, where are you going?" The Coyote said: "I am going on the war-path against my enemies. Will you join my party?" The Badger said, "Yes, I will join you." They went on. After they had gone a long way, they saw a Swift Hawk sitting on the limb of a tree by a ravine. He asked them where they were going, and they told him, and asked him if he would go with them. He said he would go. After a time they met a Kit Fox, and asked him to join them, and he did so. Then they met a Jack Rabbit, who said he would go with them. They went on, and at length they met a Blackbird, and asked him to join them. He said: "Let it be so. I will go." Soon after they had all got together they stopped and sat down, and the Coyote told them how the girl had been lost, and said that he intended to try to get her back. Then they talked, and the Coyote told them the plan that he -- the leader -- had made. The others listened, and said that they would do whatever he told them to. They were all glad to help to recover the girl. Then they all stood up and made ready to start, and the Coyote said to the Blackbird, "Friend, you stay here until the time comes." So the Blackbird remained there where they had been talking, and the others went on. After they had gone some distance farther, the Coyote told the Hawk to stop and wait there. He did so. The others went on a long way, and then the Coyote said to the Rabbit, "You stay here." The others went on, and at the next stopping-place he left the Kit Fox; and at the next -- last of all -- he left the Badger. Then the Coyote went on alone and travelled a long way, and at length he came to the Buffalo camp. He went out to the place where the young Bulls used to play the stick game, and lay down there. It was early in the morning. After a time some of the young Bulls came out, and began to roll the ring and to throw their sticks at it. The Coyote now pretended to be very sick. His hair was all covered with mud, and his tongue hung out of his mouth, and he staggered about and fell down and then got up again, and seemed to feel badly. Sometimes he would get over near to where the ring was being rolled, and then the young Bulls would call out: "Here, hold on! Don't get in the way." After a little while the Coyote pretended that he felt better, and he got up and went over to where the young Bulls were sitting, looking on at the game, and sat down with them, and watched the play with the others. Every now and then two of the young Bulls would begin to dispute over the game, each saying that his stick was the nearer to the ring, and sometimes they would wrangle for a long time. Once, while they were doing this, the Coyote went up to them and said: "Here! You men need not quarrel about this. Let me look. I know all about this game. I can tell which stick is the nearer." The Bulls stopped talking and looked at him, and then said: "Yes, let him look. Let us hear what he says." Then the Coyote went up to the ring and looked, and said, pointing: "That stick is nearest. That man has won." The Bulls looked at each other, and nodded their heads and said, "He knows. He is right." The next time they had a dispute, he decided it again, and all were satisfied. At length two of the young Bulls had a very fierce dispute, and almost came to fighting over it. The Coyote came up and looked, and said: "This is very close. I must look carefully, but I cannot see well if you are all crowding around me in this way. I must have room. You would all better go over to that hill, and sit down there and wait for me to decide." The Bulls all went over to the hill and sat down, and then the Coyote began to look. First he would go to one stick and look carefully, and then he would go to the other and look. The sticks were about the same distance from the ring, and for a long time it seemed that he could not make up his mind which was the nearer. He went backward and forward, looking at the sticks, and stooping down and putting his hands on his knees and squinting, and at last, when once his face was close to the ground, he suddenly snatched up the ring in his mouth, and started, running as hard as he could for the place where he had left the Badger. As soon as he had started, all the Bulls on the hill saw what he was doing -- that he was taking the ring away from them -- and they started after him. They did not want to lose the ring, for it was very useful to them, and they played with it all the time. When the Buffalo in the camp saw that the young Bulls had started, they all followed, so that soon all the Buffalo were rushing after the Coyote. He ran fast, and for a long time he kept ahead of the Buffalo, but they followed, a great mass of Buffalo crowding and pushing, running as hard as they could run. At last the Coyote was beginning to get tired, and was running more slowly, and the Buffalo were beginning to catch up to him, but he was getting near to where the Badger was. After a time the Buffalo were getting nearer to the Coyote. He was very tired, and it seemed to him as if he could not run any farther. If he did not soon get to where he had left the Badger, the Buffalo would run over him and trample him to death, and get back the ring. At length, when they were close behind him, he ran over the top of a little hill, and down in the valley below saw the Badger sitting at the mouth of his hole. The Coyote raced down the hill as fast as he could, and when he got to the hole he gave the ring to the Badger, and just as the herd of Buffalo got to the place, they both dived down into the hole. The Buffalo crowded about the Badger's hole, and began to paw the ground, to dig it up so as to get the Coyote and the ring, but the Badger had dug a hole a long way under the ground, and while the Buffalo were digging he ran along through this hole and came out far off, and ran as hard as he could toward the brothers' lodge. Before he had gone very far, some of the Buffalo on the outside of the herd saw him, and called out to the others: "There he is! There he goes!" Then all the Buffalo started again and ran after the Badger. 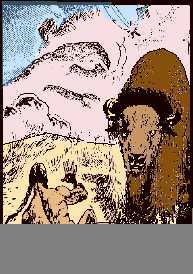 When they had come pretty close to him, he would stop running and dig another hole, and while the Buffalo were crowding around the hole, trying to dig him out, he would dig along under the ground, until he had got far beyond them, and would then come to the top of the ground, and run as fast as he could toward the lodge. Then the Buffalo would see him and follow him. In this way he went a long distance, but at length he got tired and felt that he could not run or dig much farther. He was almost spent. At last, when he dug out of the ground, he saw not far off the Kit Fox, lying curled upon a rock, asleep in the sun. He called out: "Oh, my brother, I am almost tired out! Help me! " The Kit Fox jumped up and ran to him and took the ring in his mouth and started running, and the Badger dug a deep hole, and staid there. The little Fox ran fast, gliding along like a bird; and the Buffalo, when they saw him running, chased him and ran hard. The Kit Fox is a swift animal, and for a long time he kept ahead of the Buffalo. When he was almost tired out, he came to where the Rabbit was, and gave him the ring, and ran into a hole, and the Rabbit ran on. The Buffalo followed the Rabbit, but he ran fast and kept ahead of them for a long time. When they had almost caught him, he came to where the Hawk was sitting. The Hawk took the ring in his claws and flew off with it, and the Rabbit ran off to one side and hid in the long grass. The Buffalo followed the Hawk, and ran after him. They seemed never to get tired. The Hawk, after he had been flying a long time, began to feel very weary. He would sail down low over the Buffalo's backs, and was only just able to keep above them. At last he got near to where the Blackbird was. When the Blackbird heard the pounding of many hoofs and knew that the Buffalo were coming, he flew up on a sunflower stalk and waited. When the Buffalo came to the place where he was, he flew up over them to the Hawk, and took the ring on his neck, and flew along over the Buffalo. The ring was heavy for so small a bird, and he would alight on the backs of the Buffalo and fly from one to another. The Buffalo would toss their heads and try to hit him with their horns, but he kept flying from one to another, and the Buffalo behind were always pushing forward to get near the ring, and they pushed the other Buffalo ahead of them. Pretty soon the herd passed over a hill and were rushing down to the place on the river where the brothers' lodge stood. Ever since their sister had been lost, the brothers had been making arrows, and now they had piles of them stacked up about the lodge. When they saw the Buffalo coming they got their bows and took their arrows in their hands, and shot and shot until they had killed many, many Buffalo, and the rest were frightened and ran away. The Blackbird had flown into the lodge with the ring, and after the brothers had finished killing, they went into the lodge. And there, sitting by the fire and smiling at them as they came in, they saw their sister. Page prepared by Paula Giese graphics and layout copyright 1996. CREDITS: George Bird Grinnell, article in Harpers, 1902; published in Grinnell's book of Plains Indian legends, Punishmnt of the Stingy, see University of Nebraska Press booknote for publication and purchase info. Picture: scanned from black and white comicbook style history Commanche Moon by Jaxxon, published by Rip-off Press in 1976, now unfortunately out of print.